Serves 4 for the basic recipe, more if you add other vegetables. Make the rice to put the stir fry on. Once it has cooled: add the soy sauce, sesame oil, and cornstarch, stirring until cornstarch has blended with liquid. You can use a whip to blend it if needed. If it is still very warm, it might be easier to put the cornstarch in a small bowl, add some of the liquid, mix, then add to the large bowl of sauce and stir in. If using ground ginger or garlic powder, add them to the sauce too. Put half the fresh garlic and ginger in the oil, and then add the chicken and brown until cooked through. (about 4-6 minutes for chunks, 6-8 for strips) Remove from oil, drain and keep it warm. Add the onions, and when they are transparent, add the carrots and celery. Stir fry for 2 minutes, then add the broccoli. If using any other vegetables add them after the broccoli has cooked about 2 minutes. Add remaining ginger and garlic. Add the chicken back in. When vegetables are just cooked through, add the liquid with cornstarch. Let it come to a boil and bubble for 1 minute. Serve over cooked rice. Add any of the following, or subsitute for the celery. If adding more than 2 cups additional vegetables, add 1/2 tsp bouillon, 1 1/2 Tablespoons cornstarch, 1/2 cup water to the basic recipe. If you are using 2 cups cabbage count it as 1 cup for this purpose. You might need to increase soy sauce by 1 Tablespoon also. You could raise the meat to 1 1/2 lbs if you add several cups vegetables. You will also need slightly more cooking oil. 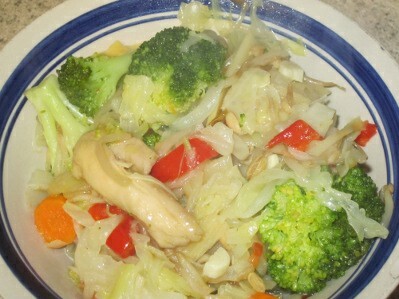 This simple chicken stir fry can be made quickly if you cut your vegetables ahead of time. Have everything chopped and ready in bowls before you start cooking. It is a nourishing and tasty gluten free meal. If you are soy intolerant, then use my Soy Sauce Substition Recipe. Also, be careful when buying fresh bean sprouts, to be sure they are mung beans, not soy bean sprouts.